For $150/hour, you’ll have a captain and a yacht and a chance to sail a most beautiful stretch of the Pacific Ocean. Call 805.750.7828 for availability and other information. We’re heading for Anacapa Island for lunch. Anacapa is about two and a half hours from our home port. We like to get under way on our economy sailboat rental about 1000 and come home about 1700 (5pm), but we can flex with your schedule. In any event, we’ve got a minimum of five hours of sailing. We’ll anchor at Frenchy’s, East Fish Camp or Cathedral Cove. But Frenchy’s is usually the best protected. Frenchy’s is one of our favorite spots for lunch. It’s usually protected from the winds and offers spectacular views of this, the smallest island in the Channel Islands. Anacapa is about three miles long (it’s really three very closely spaced islands), and yet is only one square mile. Nevertheless, folks tried to raise goats and sheep here – in spite of the size and in spite of the lack of water. There are some great stories about this spot, but I’ll save those for the cruise. our little patch of the Pacific has more than 150,000 sea lions, seals of several varieties, two species of dolphin that we see all the time and bajillions of seabirds and whales: blue, humpback, gray, finback, minke and occasionally Orcas, which are not whales, but dolphins. But we’re not arguing the point. you some basic instruction. 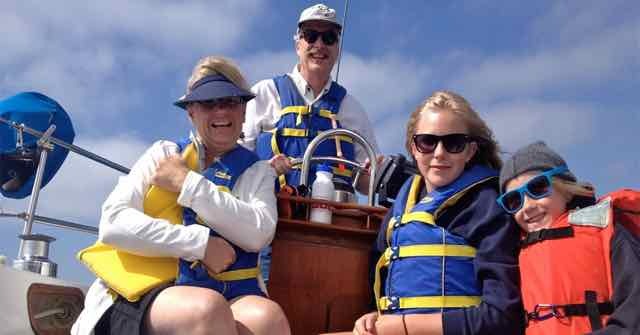 This is a sailboat rental with lots of extras and added safety. Wiley is 36 feet, not small, but she’s not huge either. If you’re experienced, you can take her into the anchorage and set the anchor … but if you don’t have that kind of experience, I’m happy to walk you through it. Once we’re anchored, I’ll serve lunch. It’s usually deli sandwiches, fruit, dessert (don’t let me take any! ), soft drinks and water and chips (don’t let me have any of that, either). We’ll talk about what you’d like to eat when we set up your cruise. Please call me at 805.750.7828 with your questions or to book an economy sailboat charter. Or e-mail me at Day Cruises with your questions. *There is 5% harbor tax on all charters.